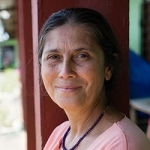 Robin Lim,("Mother Robin," or "Ibu Robin") is a midwife and founder of Yayasan Bumi Sehat (Healthy Mother Earth Foundation) health clinics, which offer free prenatal care, birthing services and medical aid to anyone who needs it. She and her team have been working since 2003 to combat Indonesia's high maternal and infant mortality rates, and the Bumi Sehat birth centers serve many at-risk mothers. She was awarded the 2011 CNN Hero of the Year award by the CNN news network for helping thousands of low-income women in Indonesia with healthy pregnancy and birth services. This presentation will describe the cultural significance as well as the physiological functions of the Placenta, and the difference between early and late clamping and cutting of infants’ umbilical cords. Robin Lim will discuss the role of Midwives in advocating for the human rights of newborns, and emphasize that what Midwives do in the birthroom sets the tone for success, or failure of family relations. We want Midwives to be informed of their essential role in the survival and rebuilding of communities who face disasters. Globally the surface temperature is increasing. As our Oceans warm, storms are getting bigger, and more frequent. Drought, heat waves, cyclones, unpredictable precipitation and snow, famine, strife, plus earthquakes (fueled by Global Warming, the Earth’s crust is on the move). Today on Earth there are five times as many disasters as there were in the 1970s. According to the World Meteorological Organization Statement on the Status of Global Climate in 2015: "The warming trend and an increasing number of disasters are expected to continue for several decades.” Experience bringing Midwife-to-Mother care to parts of the planet devastated by disaster has taught me that traumatized communities NEED their midwives. When people suddenly are left homeless, hungry and thirsty, when hospitals and health centers are razed and roads impassible, pregnant women must still have their babies. In addition, Globally, it is the midwives who are trusted as the first go-to medics, when a child is hurt or an elder is ill. In the Samatiga area of Aceh there were 154 midwives before the 9.3 earthquake and tsunami in 2004. Afterwards, there were 32 midwives left alive. These women, also homeless, grieving their dead, without food, water, light or medicines, were the first to respond to the sorrow, suffering and trauma of the people. Attending this session has the potential to help Midwives be more prepared for their role, should disasters continue to strike.